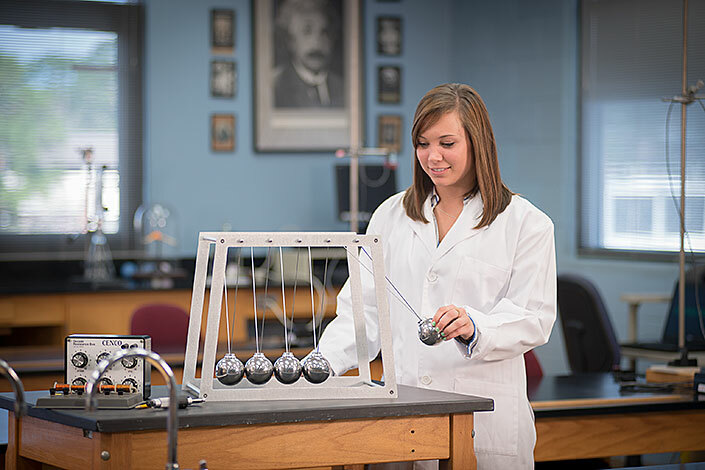 Using a Newton's Cradle for demonstration has long been a favorite go-to tactic for science teachers at all levels, along with instructors and guides at museums, science centers and more. However, finding a high quality, durable and attractive Newton's Cradle for institutions has been next to impossible. Thankfully though, GiantNewtonsCradle.com has come to the rescue, producing the finest Newton's Cradle for demonstration available today, made from a patented design based upon durability, utility and beauty. The size of the Giant Newton's Cradle measures 17 inches by 10 inches, and stands 14 inches tall. 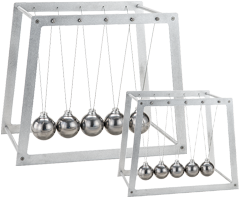 With a total weight of nearly 11 pounds, and five 2.5 inch nickel plated chrome steel spheres, the design is not only great science, but also a great piece of art, making it the perfect Newton's Cradle for institutions and collectors alike. Audiences love this Giant Newton’s Cradle and are in awe as the spheres click and energy transfers across these giant Newton’s Cradle spheres. The Giant Junior size measures 12 inches by 7.75 inches, and stands 11 inches tall, with five 1.5 inch spheres and a total weight of nearly 5 pounds. 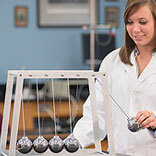 This can also make a great Newton’s Cradle to use in schools or for demonstration purposes. The smaller size and lighter weight make it ideal for transporting to different lecture rooms or classrooms. Our Newton's Cradles, are perfect for teaching and demonstration and are built to last, with a laser-cut aircraft aluminum frame, galvanized aircraft cable, and precision engineering. It will be shipped to your address fully assembled with safe custom-designed packaging, ensuring it's in perfect condition and ready to be utilized immediately. It’s still the most rugged and durable Newton’s Cradle on the market, so it’s perfect for children to get a hands-on demonstration of Newton’s Cradles and the physics behind them. We look forward to hearing from you – and know that you will be amazed at just how cool a giant Newton's Cradle and so will your audience. Whether you are looking for our Giant Newton's Cradles for teaching a class or for demonstration purposes in an auditorium these Newton's Cradles are sure to impress! These Newton's Cradles look great on a desk or in a display, and make great gifts! Our Newton's cradles are made of high quality aluminum and have a durable, rigid architecture. It won't wobble or break during a demonstration. You won't find another Newton's Cradle on the market with as good a build quality as these. Materials like galvanized steel aircraft cable mean that these Newton's Cradles don't tangle either. The tangle free Newton's Cradles allows children to use them without worries that your institution or school needs to replace them!